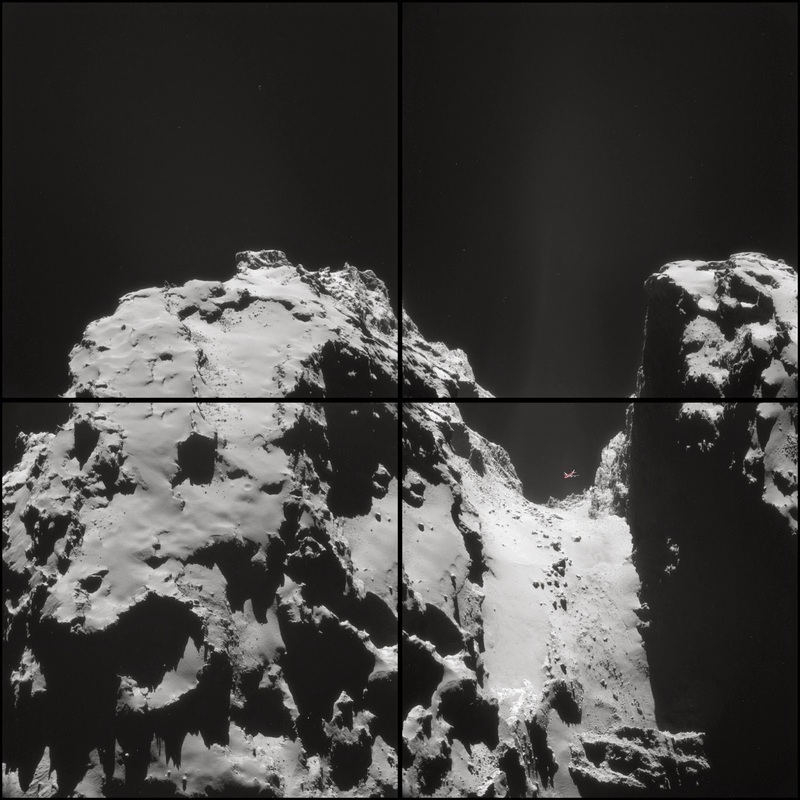 I've posted before about the Rosetta space probe, that is in the process of making a rendezvous with comet 67P/Churyumov-Gerasimenko. The fact that we can send spacecraft to land on a comet that's approaching our Sun is nothing short of amazing. I am very aware of the vast cosmic distances in the Universe, but I still find the size of the comet to be mind-boggling. When you think of a comet, you probably imagine a big boulder floating through space. However, at 2.5 miles across, this is a pretty big object. Of course, I'm speaking in terms of scale to us tiny humans. In a cosmic scale, it's a piece of dust. 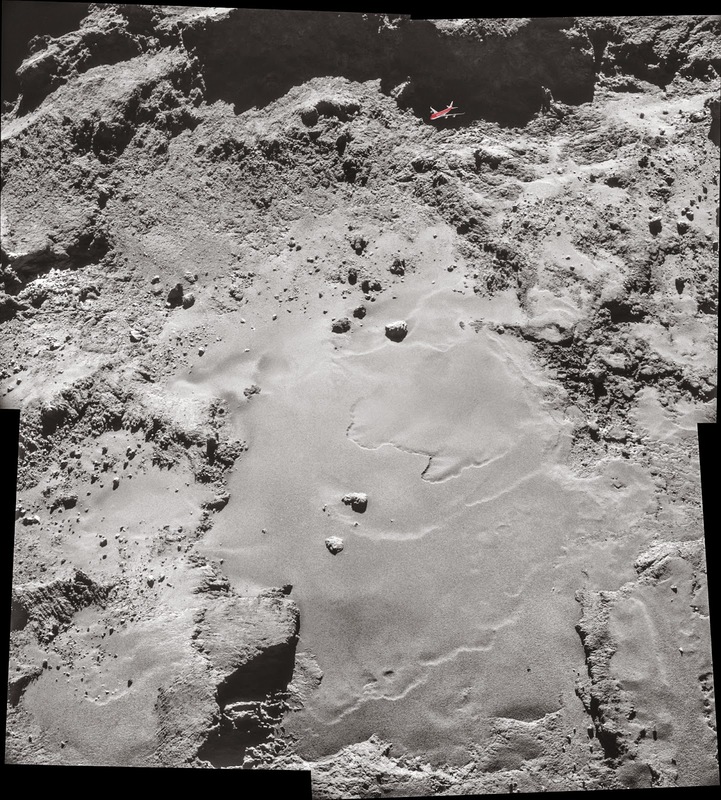 To give a better perspective on the size of the comet, Reddit user grouchymcsurly placed a 747 jet into some of the pictures, at the correct scale. I played the first 2 installments of this series & reviewed the original Dead Space. These games are 3rd person shooters with a sci-fi horror survival theme. The first Dead Space blew me away with the sense of fear and dread it instilled, as you tried to survive onslaughts of Necromorphs in creepy abandoned space stations & ships. The second one wasn't as good, but Dead Space 3 brought back alot of the impact I felt in the original. Although there were excellent sequences in space & zero gravity, much of the story takes place on the ice planet Tau Volantis. This is the planet of origin for the alien "markers" that featured in the series. These markers are covered in strange glyphs and have been found scattered throughout the galaxy. They drive people mad, turning them into marker-worshiping zealots, & also revive dead bodies into the zombie-like Necromorphs. Although the frozen setting, with abandoned human settlements & research areas, makes for an effectively claustrophobic environment for Necromorphs to jump out at you, I preferred the settings that took place in outer space. However, there was a sufficient variety in the environments that I never felt that the scenery was visually boring. The game's strongest point is it's core feature- the survival horror aspect of the gameplay that continuously keeps you on the edge of your seat & ready to scream out expletives. Even when I knew the hideous, relentless creatures were coming, I still freaked out with anticipation at the inevitable vicious attacks. Most of the time, the Necromorphs would unexpectedly come from all angles as I would frantically try to use whatever weapons I had on hand to simply survive the encounter. While I'm talking about the weapons, I'll mention the creative weapon crafting system in the game. Throughout the campaign, you collect various components such as frames, the actual weapons components, and attachments to customize your weapons in an endless variety of combinations. For example, you can have a gun that fires electrified bolas, with a secondary buzzsaw attached ...or you can have a shotgun, with a secondary rocket launcher. There are many possibilities, which gives you alot of freedom in coming up with weapons that you think will be most effective against the creatures. The only downside is that I found myself spending too much time tinkering with the weapons & having trouble deciding which ones to use. There were a few select weapons that I used frequently, since the waves of Necromorphs could be so furious & overwhelming that I needed firepower that I knew could take them out quickly. There were only brief moments where I felt that I could relax & there were not going to be any monsters popping out at me. Besides the unpredictable appearance of the enemies, the mood was mostly set by the visual effect of the environments & the unnerving sounds coming from dark corners or unseen places. Dark areas with flickering lights and strange screeches coming from nearby areas where enough to keep me on edge throughout the game. My only complaint about the sound was that there was too much background music. In the original game, the anxiety was enhanced by the silence of your surroundings, except for your breathing and unsettling ambient noises. I feel like having dramatic soundtracks in certain areas was unnecessary & didn't have the same effect as an uneasy quiet. Overall, I enjoyed Dead Space 3 & definitely recommend it, if you'd like a games that provides continual adrenaline rushes, due to the fear of being destroyed by undead space creatures. Anatomy is a subject that becomes more amazing as you learn more about it. 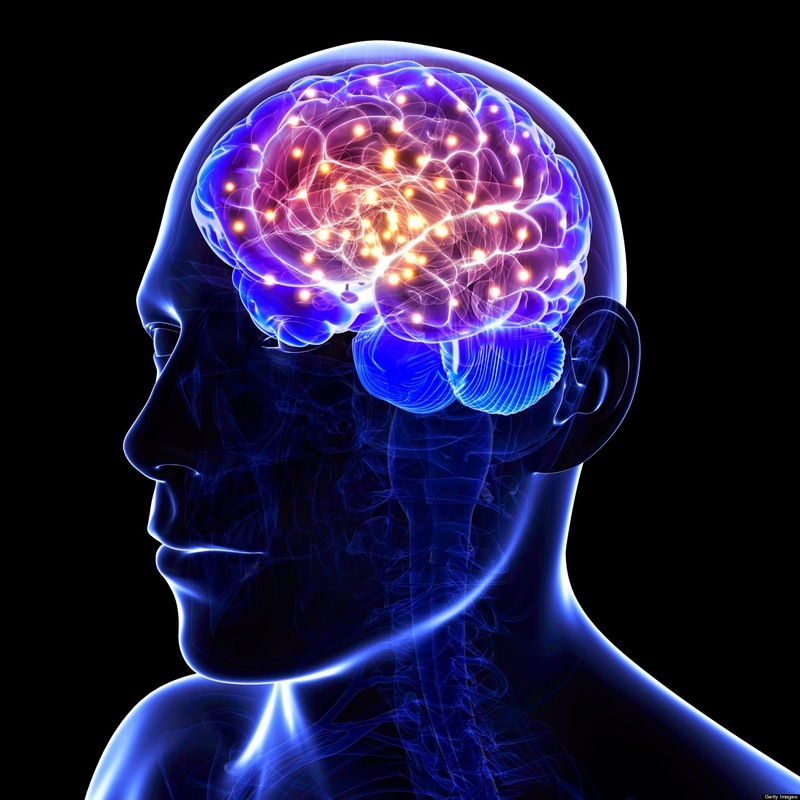 The brain is especially interesting, since it is the seat of our conscious mind and our sense of being. I've come across some information online that provides some deeper understanding about this vital organ & its cells. Finally, this video might not be for the squeamish, but it shows the gross anatomy of an actual brain from a medical donor. The fact that our experience is processed through this soft, wrinkled mass that fits inside our skull is, well... mind-boggling. I am endlessly fascinated by the complex world of which I am a part. There are infinite continuous levels of reality- from the spectrum of the cosmic phenomena of the very large, to the tiny features below our threshold of perception. With advances in technology & photographic techniques, it is now possible to visually experience things that have never been able to be seen before. On this isn't happiness, I saw some awe-inspiring photos from Nikon's photography competition that focuses on microscopic phenomena. The website has galleries of entries going back a few decades. A couple of my favorite topics, that I've posted about many times here, are bad design & Star Wars. 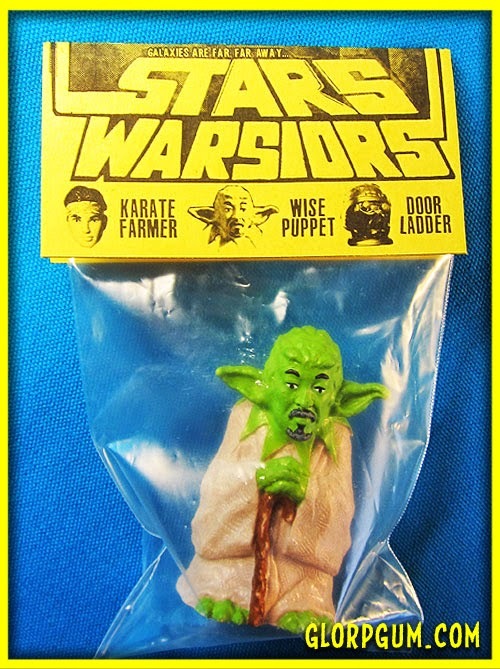 In my travels through the Internet, I came across a ridiculous pairing of these two favorite things, in the form of a set of bootleg toys called "Stars Warsiors". I tracked the source down, to the website of illustrator Brad McGinty, who claims he found them in a dollar store... but I'm not sure I believe it. I want to think these are a subversive art project, & that no manufacturer could actually produce something this absurd. 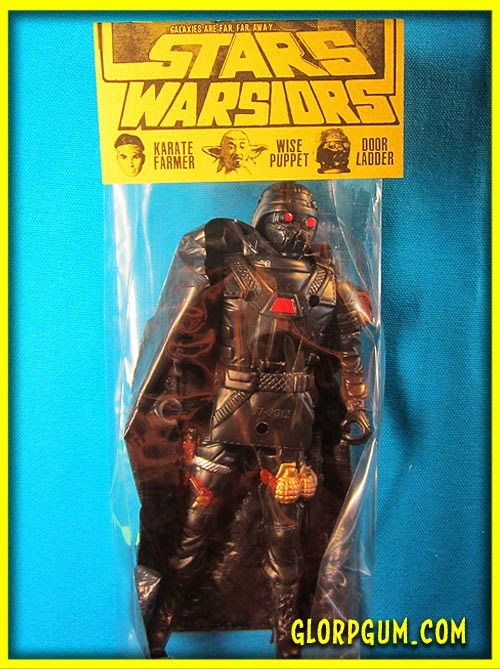 On his blog, he had pictures of these insanely bad toy knock-offs & created a Star Warsiors T-shirt. This is an awesome looping animated GIF, made from one of the opening sequences from The Simpsons. It playfully suggest the infinite, fractal nature of our own Universe. I've started a Facebook page for The Monkey Buddha blog. If you are on Facebook, please 'Like' the page, to get the latest posts in your Newsfeed. I'll also put a link on my profile info, on the side of this page. I used to play the original "Civilization" game when I was a kid. You used strategy & resource allocation to build up cities and control areas of a map. It was very addicting & was a fun way to simulate the evolution of nation states. A few years ago I bought my brother Civ IV for his birthday, since he also used to love the game when we were younger. Even though the core gameplay was similar, the graphics were light years better & the game was much more sophisticated, overall. He says he's spent many hours building nations & empires, so apparently it's just as engrossing as the original. I recently saw a trailer for the latest installment of the series created by Sid Meier. This game moves off our home planet, among the stars. The trailer for the new Civilization is cinematic & doesn't show any of the gameplay. However, it is a thought-provoking look at man's destiny to leave the planetary womb of Earth, to find other inhabitable worlds throughout the infinite expanse of interstellar space. 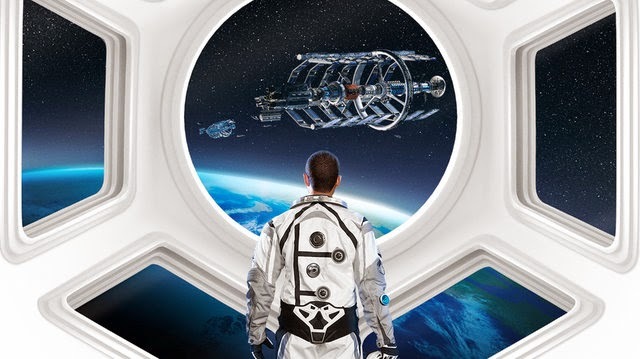 I've posted here many times about the importance on space travel for the survival of the human species. Besides the technological hurdles that must be overcome, we tend to forget the emotional dimension that will inevitably accompany humanity's migration off-planet. The trailer very effectively conveyed the deep emotional experience that will be felt by our descendants when this journey begins. It also shows the influence of ancient institutions, such as religion & politics, will have on the endeavor. 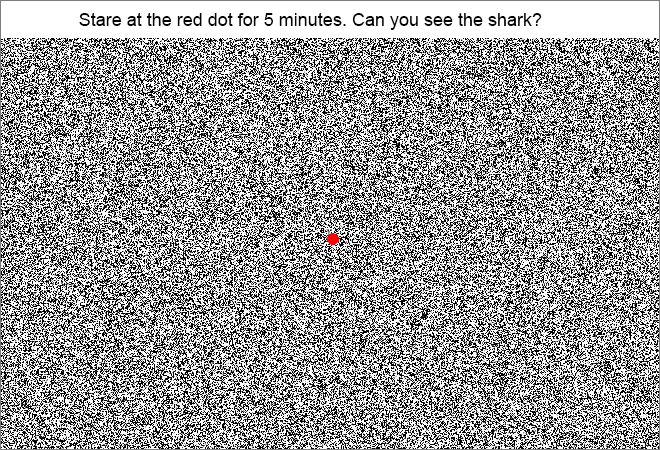 • Did you stare at the picture above for 5 minutes, looking for the shark? • Does the inability to see the number "82," in the picture below, upset you? If you answered yes to either of these questions, then you fell for some of the world's worst optical illusions! To make up for those trick illusions, here is a cool video by Young Rival that is a motion stereograph. When you re-focus your eyes, as shown in the beginning of the video, a 3D image appears within the seemingly random visual noise. These autostereogram images were popularized in the 90's, in Magic Eye posters & books. I've posted this picture before, but found a better quality image. It is a picture of an enlightened being meditating on Death. Although it seems macabre to think about dying, I deeply love Life & the incomprehensible miracle of being alive. One thing that keeps me fully aware and appreciative of the experience of living is the awareness of my own mortality. The realization that, one day, I will no longer be in this world helps me to live with a greater sense of immediacy in the present moment. 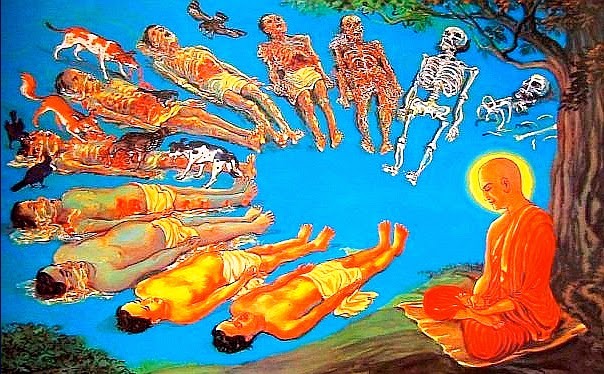 The Buddha taught that meditating on the inevitable death, decay, & dissolution of one's own body was a way to overcome the ego & delusional sense of "self" that is an illusion of our limited perceptions. Only by accepting and contemplating the idea that our bodies will soon cease to exist, can we overcome the fear of death and truly awaken to the rare treasure of being alive. “This existence of ours is as transient as autumn clouds. is like looking at the movements of a dance. On Boingboing I saw this funny & accurate comic, from the Tom the Dancing Bug strip by Ruben Bolling. It looks at how the primitive monkey mind of a human being evaluates the risks associated with different threats. 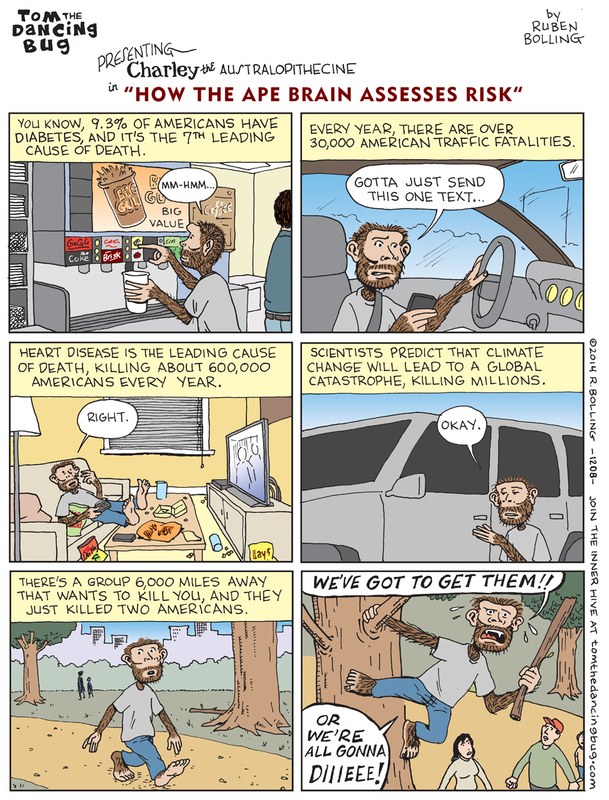 People tend to conveniently ignore overwhelmingly evident dangers- such as those presented by climate change, or disease due to poor diet & lack of exercise. I've been closely following the development of the Oculus Rift, the virtual reality hardware at the forefront of popular VR technology. I'm looking forward to experiencing the Oculus one day, but it should be clear to anyone that the possibilities of immersive VR are limitless. Far from being a useless or escapist distraction from the "real" world, virtual reality is simply a new way to receive novel information & sensory input. It's no different than a movie, TV, a book, fine art, or any other human creation that can stimulate our minds. Video games are a primitive form of virtual reality, in which you are able to explore situations & worlds that exist only in the human imagination, both individual & collective. Although I like to exist in the physical world, I've always enjoyed video games. They are almost an 'alternate consciousness' consisting of explorations into engaging scenarios & mental states. 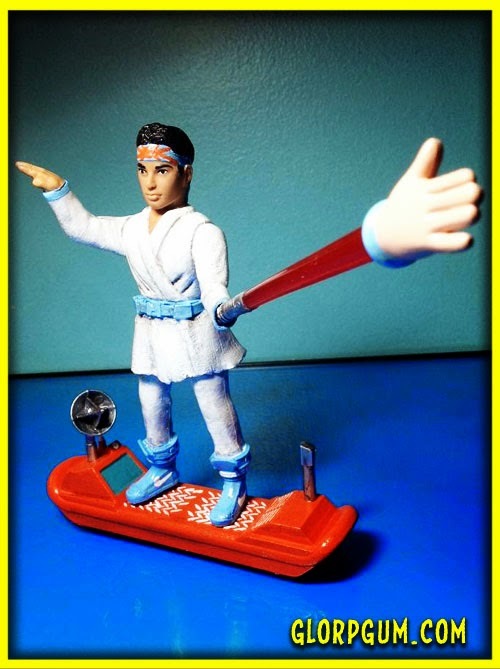 By synergizing our brains with electronic media (or other future tech that we can't imagine), perhaps we will eventually create parallel streams of experience. We might also be able to fractalize our minds, creating numerous embedded levels of simultaneous thought. Below are a few Oculus Rift applications that I think are especially cool-looking. Some of them deal with one of my favorite topics, and the source of humanity's future in the Universe, ...Outer Space. I think it's interesting how there are video games in some of these virtual worlds... games within games, realities within realities. Its similar to the idea of fractally embedded consciousness I mentioned before. In my last post, I talked about the merging of mind & machine, which could result in the evolution of visually telepathic communication. In fact, this is already occurring, through the increasing use of graphic elements in our day-to-day digital interactions. People use pictures in email, many posts on social media are basically images or video, and text messages are now reliant on emoticons or emoji to accompany their words. 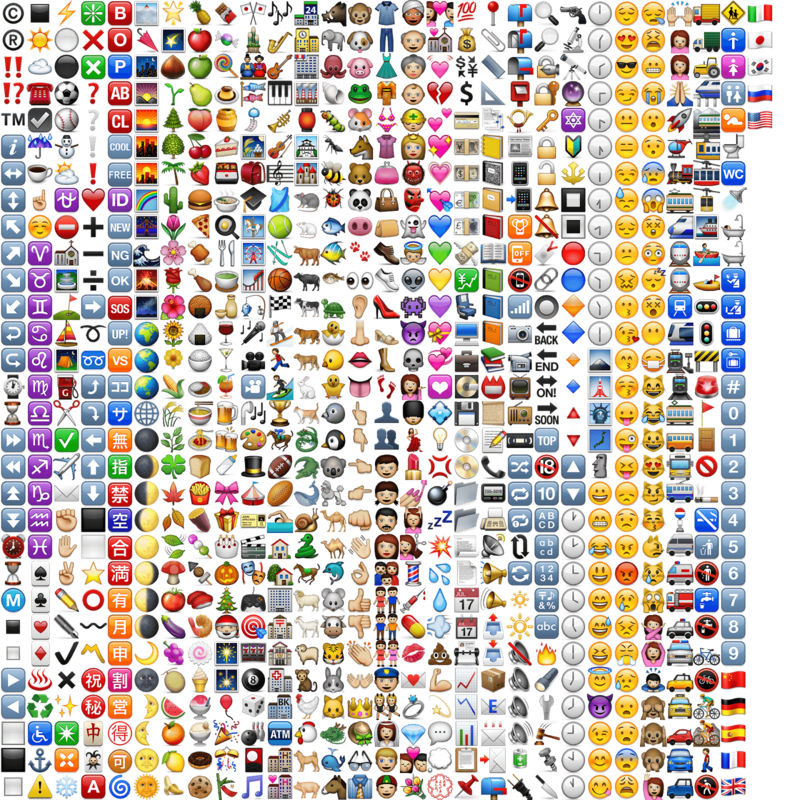 Emoji are a relatively newer phenomenon that originated in Japan, meaning "picture character". 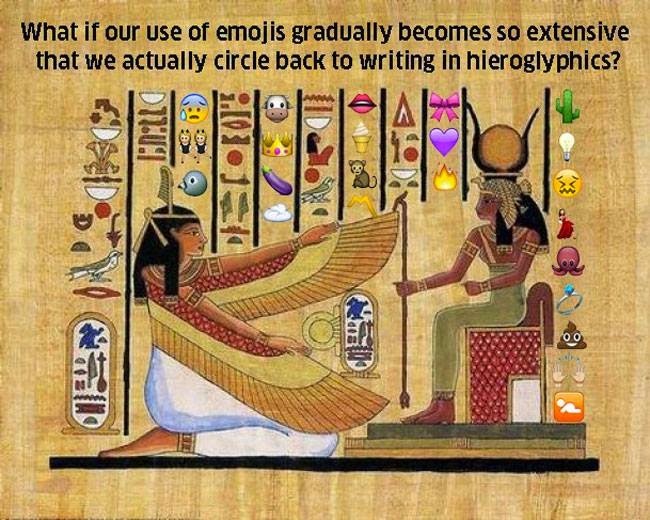 They are pictographs that are used in smartphone texts or social media. 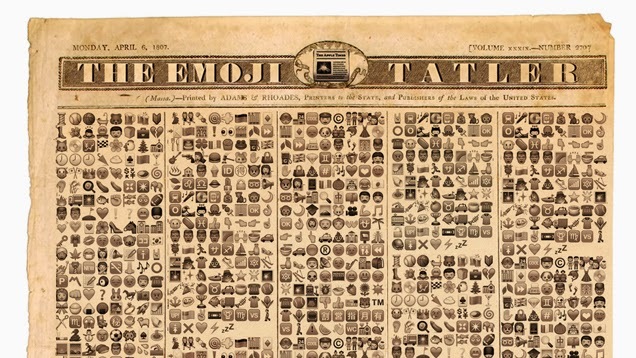 Unlike emoticons, that rely on existing typefaces, emoji can represent a limitless array of objects & ideas. Ever since I got an iPhone, I've been using emoji in many of my text messages. I use them mostly when communicating with people I'm close to, in order to convey how I'm feeling, humorous ideas, or just to have fun & make combos of emoji to try to create a mini narrative without using any words at all. The ability to convey ideas through pictographs is undoubtedly leading us to a much deeper system of symbolic language. I think there will be eventually be forms of communication that we can't even conceive right now. 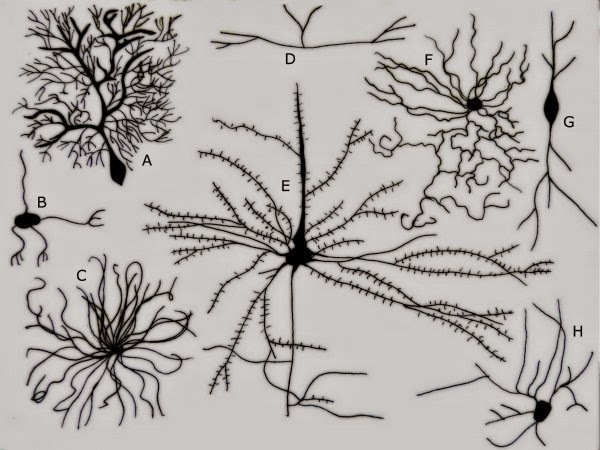 Expanded perceptual abilities will lead to directly-shared experiences & conceptual constructs between interconnected, electronically-augmented minds.